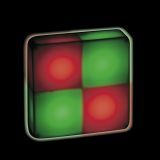 Add headlights to your fingertips! 3/4" x 1 1/2" Batteries included. Assorted. Make your fingers sparkle! 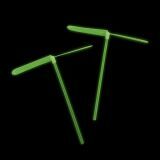 These 1/2" by 5" beams strap to your fingers for glowing fun! Rayon. Finger Beam Lights. 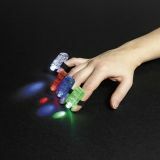 You won't know what to point at first with these cool and colorful finger lights. 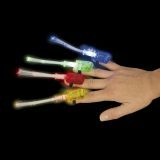 Pass these mini lights out as party favors at your next party or event and watch adults and kids alike have fun with these kids' toys. 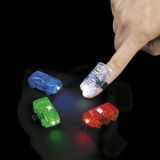 These Finger Light Beams are perfect for placing in gift bags or giving away as a raffle prize. Whether hosting a party, or just looking for something fun to pass the time, these playful lights are sure to be a hit day or night! Assorted colors. Includes on/off switch and elastic strap to attach them to your fingers. Plastic. 1 1/2" Batteries included. 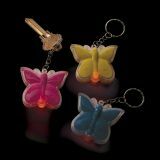 Large Beam Flashlight Key Chains. 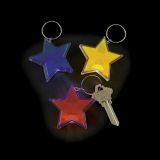 Keep a light handy with these plastic key chains! The beam of each bright light will help illuminate your surroundings. 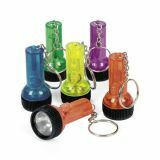 In a rainbow of fun colors, these tiny flashlights make a great favor for any evening party or event. Assorted transparent colors. 2 1/8", Batteries included. Button must be held down to operate. 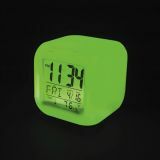 Plastic LED Color-Changing Mood Clock 3"
Plastic LED Color-Changing Mood Clock. (1 pc./DB) 3" Requires 4 “AAA" batteries (not included). Colors change from green to orange. Includes an on/off switch. 6" Display Box. Requires 3 "AA" batteries, not included. 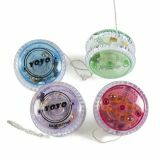 These spinning flyers have blue LED lights for lots of high-flying fun! (6 pcs. per pack) Assorted colors. Plastic. 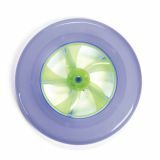 6"
Light up the night when you play an evening game of catch with these fun Light-Up 9" Flying Disks. 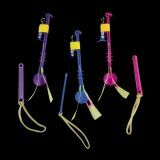 Perfect for kids and adults at any outdoor event! Assorted Colors. Batteries included. 2"